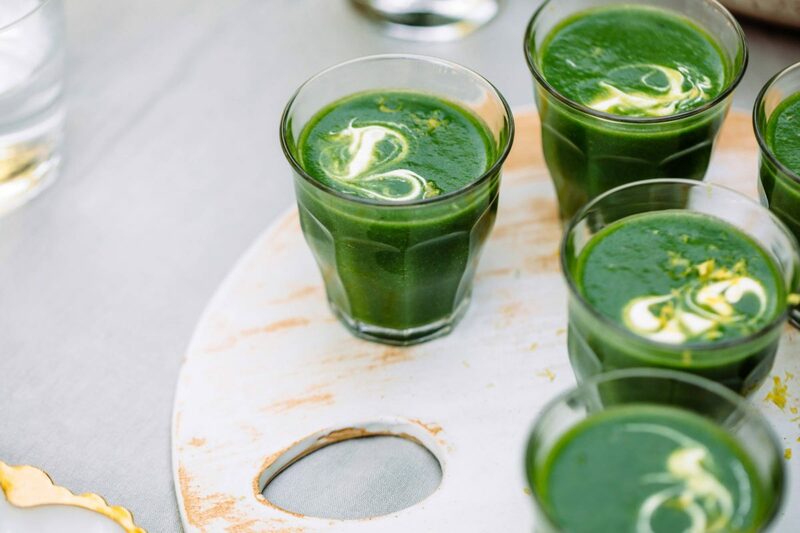 Vibrant green with delicate spinach flavor and a whole lot of nutritional goodness, Erika Lenkert’s simple spinach and potato soup looks and tastes like spring, though it can be enjoyed year-round. Skip the sour cream swirl and it’s dairy-free. In a large skillet with a lid, over medium-high heat, combine 2 tablespoons water and the spinach. Cover and cook just until the spinach is wilted, 3 to 4 minutes. Transfer to a bowl. Wipe out the skillet, add the olive oil, and heat over medium-low heat. Add the potato and cook, stirring occasionally, until starting to soften without browning, about 7 minutes. Add the onion and cook, stirring occasionally, until the potato is cooked through, about 6 minutes longer. Add the garlic and cook, stirring, for 2 minutes. Add the spinach and chicken broth and a few grinds of pepper. Increase the heat and bring to a simmer. Immediately remove from the heat, blend in a blender until smooth, season to taste with salt and pepper, garnish with sour cream and lemon zest, and serve hot.